Passengers in Dublin Airport who were stranded after their flight to Manchester was cancelled. 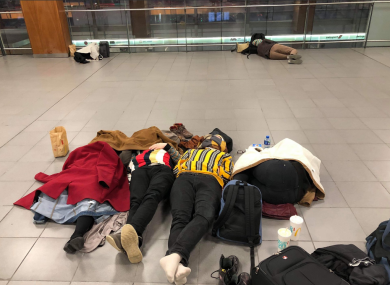 PASSENGERS EXPERIENCED LONG delays and flight cancellations at Dublin Airport yesterday, with some sleeping on the floor last night after their take-offs were postponed for hours. A snow and ice warning was in effect for the country yesterday and snowfall on the east coast led to de-icing issues at the airport. Ryanair in particular came in for criticism for its communication on last night’s issues after it experienced problems responding to the ice and snow, leading to hours-long delays. Passenger Katie Monnelly said she was stuck on a stationary Ryanair flight to London and spent three hours on the tarmac before passengers were told to disembark at 7pm. The plane eventually took off at 9.45pm last night. Monnelly told TheJournal.ie that while the pilot and staff handled the situation well, a raft of Ryanair flights experienced long delays. The airline came in for criticism from passengers for its lack of communication after its Twitter account went dark for a period of three hours last night, only returning before 11pm with a brief update about “a small number of Dublin cancellations”, before operators went offline until early this morning. Dublin Airport also came in for criticism from Monnelly and others affected by the delays for their communication on problems yesterday evening. The official Twitter account informed passengers that it was “open and operational” but that some airlines were experiencing delays. Some passengers took issue with the messages, maintaining the updates should be changed to warn of more severe delays. An airport spokesperson said this morning that all runways, taxiways and parking stands were clear of snow and ice throughout yesterday “and were operational at all times”. “Unfortunately, some airlines had an issue with de-icing their aircraft yesterday evening and that resulted in delays to some departures. “This had a knock-on impact on the availability of aircraft parking stands for some arriving aircraft, as because the departing aircraft had been delayed due to de-icing issues they were still occupying the parking stands in question. “We sincerely regret the impact that airline de-icing issues had on passengers’ travel plans. Ryanair has not responded to a request for a statement on last night’s delays but said in last night’s tweet that “all those affected were advised of their rebook/refund options”. A number of passengers were left with no information on their delayed flights leading to many sleeping in the airport overnight. Passenger Sarah Talbot has been waiting in Dublin Airport since 4.30pm yesterday after her flight to Manchester was cancelled and remains at the airport this morning. She told TheJournal.ie that she queued for three hours to speak to a Ryanair representative to get some information about her flight but said the desk closed before they saw everyone in the queue. We looked around for any hotel or seat but there weren’t any which is why we were on the floor. It was cold, noisy and stressful. She added that staff at the departure gate “were almost running away from anyone who had a question”. Sarah hopes to get out of Dublin Airport on a flight later this afternoon. Plenty of passengers in a similar situation to Sarah took to Twitter to vent their frustration. Passenger Laura Joyce told TheJournal.ie that she sat grounded on her Ryanair flight yesterday for four hours before she was told it had been cancelled and everyone had to disembark. “No one kept us updated whilst we waited on the plane, we then didn’t speak to or see a single member of staff on the ground,” Joyce said. After disembarking the plane she was told to join the queue, pictured above, which she says was the only time she saw a Ryanair representative. Joyce said she booked a hotel and flight last night out of her own pocket and now has “the pain of reclaiming it all”. She added that she had to book a flight with a different airline because there were no Ryanair flights to Gatwick until Tuesday. Anyone travelling from Dublin Airport today has been asked to check with their airline for flight updates. Aviation expert, Kevin Byrne, told TheJournal.ie that each airline – if they don’t have their own equipment – have a contractor in each airport which de-ices aircraft in the conditions in which they have ice. “You’re not allowed to take off an aircraft if it’s contaminated on any of its air-dynamic surfaces with ice or snow. Byrne said the trouble with these machines is that they are extremely expensive to buy and airlines usually only have two or three maybe. It might take as long as 15 minutes to de-ice each aircraft properly and it should be airborne once it within 40 minutes of the last of the spray going on the aircraft. It’s specialised, you have to get the staff in, get the equipment out, fill up the tanks of these things. “From what I’ve seen at the airport there is a limited resource in terms of the equipment because they can cost as much as €150,000 each and in Ireland, you wouldn’t always need them,” he said. “When you fill up the tanks and you spray three aircrafts you have to refill it again. If there are ten aircraft, it’s going to take a while to fill them up,” he said adding that the queuing system for the runway would also have had a knock-on effect with delays. Email “Passengers sleep on the floor at Dublin Airport after snow and ice causes major delays ”. Feedback on “Passengers sleep on the floor at Dublin Airport after snow and ice causes major delays ”.